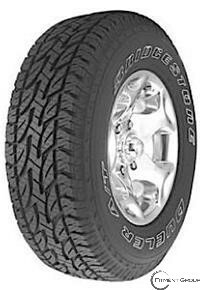 The R- or S-speed rated Bridgestone Dueler A/T REVO tires feature outline white letter sidewall styling on one sidewall and stylized black letter styling on the other. They are available in popular P-metric, LT-metric and Flotation light truck sizes for 15" and 16" wheel diameters. ?